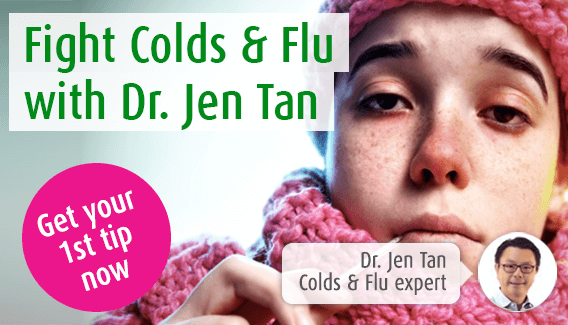 Will I get flu from the flu jab? This is one of the questions we were asked recently via our A.Vogel Talks Immune System pages. It is an interesting question for two reasons: some people do indeed experience flu-like symptoms after receiving the flu vaccination; and, to understand why this is so, we need to understand what the flu jab is and what it does to the body. The flu vaccination is an injection of viruses into the body. These viruses are grown in a laboratory and then killed so that they do not have the ability to reproduce themselves. The strains of viruses found in the flu jab changes every winter. At the start of each year, the World Health Organisation (WHO) looks at the viruses hanging around and picks a few suspects that are most likely to cause problems during the next Northern hemisphere winter. You might recognise some of these names. H1N1 is the virus that caused the swine flu scare in 2009 and H3N2 is also known as the bird flu virus. Although ‘dead’, when introduced into the body, the purpose of the flu jab is to allow the cells of our immune systems to see what these viruses look like. It is a bit like issuing ‘wanted’ posters of dangerous criminals – even if you have not previously come across one of these ‘troublemakers’, your body’s immune system now knows what they look like, will recognise them quickly and mount swift and strong action if they enter your body. So can the flu jab give me flu? It can appear that way, but the strictly accurate answer is no. People may experience ‘flu-like symptoms’ such as aching muscles and joints or even a slight fever after a flu jab. This normally lasts for 1 and 2 days and feels similar to the start of a bout of flu. The reason for this is that in some people, the viruses in the flu jab trigger a strong immune response because the body thinks that the infection is real. Immune chemicals are released as a result, leading to aching muscles and joints, headache and fever. Guidance from health authorities around the world suggest that people who are over 65, those with a significant underlying health problem and those vulnerable to infection should be vaccinated in October or November each year. The reasoning is that, if infected, this group of ‘vulnerable’ people will suffer more severe symptoms and are more likely to develop complications. Flu jabs however, are controversial and some, including many who prefer the use of natural medicines, are sceptical of their benefits and point to the potential for side effects, including the development of flu-like symptoms. The flu jab will not prevent you catching the common cold. Nor will it prevent infection by the many influenza viruses hanging around, other than the 3 (or 4) you are vaccinated against. There is also another problem. Viruses causing flu have a habit of changing their appearance. This process, known as mutation, is the reason why on average we suffer 3 or 4 cold or flu infections each year. By contrast, the chicken pox virus does not tend to mutate and so, it is unusual to get this infection twice in a lifetime. The viruses in the flu jab look back at what caused problems 9 or 12 months ago. This means that it is unlikely to help with any ‘new’ viruses nor mutated viruses arising out of the strains you have been vaccinated with. As the flu jab will not give you protection from the majority of viruses encountered each winter, the key principle is to keep your immune system as strong as possible. You will have heard the usual advice of watching your stress levels, ensuring plenty of sleep and having a good diet. Whilst seemingly obvious and mundane, this still stands as the best advice you can follow. If you are prone to infections, a vitamin supplement and Echinacea will help. Apart from strengthening the immune system, Echinacea also has the advantage of direct anti-viral properties. So, we come round a full circle. If your immune system is strong, your body will be able to mount a healthy response to any virus invading your body. This is what the flu jab tries to achieve for the 3 viruses this year. If you are not vulnerable to infection you might, logically, fall outside the guidelines set by the government. Perhaps then, there won’t be any need for you to have the flu jab?